To harness genetic diversity to improve goat productivity in Africa, the International Livestock Research Institute (ILRI) is testing the open data kit (ODK) in Ethiopia as a tool to collect baseline data on production systems and phenotypic characterization of goats. It will also be tested in Cameroon. The project is led by the Biosciences eastern and central Africa – International Livestock Research Institute Hub and financed by the Swedish International Development Cooperation Agency. ‘ODK Collect‘ is an open source program to collect questionnaire information. It immediately digitizes data for analysis, allows for remote monitoring of the collection progress, and facilitates the gathering of data, eliminating the need for paper surveys and therefore significantly reducing survey times. In this test-employment, the ODK Collect program was installed on Samsung Galaxy SII smartphones and the questionnaires were written in xml format which are subsequently saved to the phone’s device memory. The system allows users to ask questions with a predetermined ‘if‐then’ logic system, relying on answers to previous questions. The program also supports the incorporation of GPS points, photos, videos, bar codes, and sound bites as attachments to surveys or as the basis of the questionnaire responses. 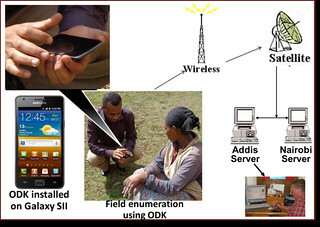 The results recorded on the phones are sent to ILRI servers in Addis Ababa and Nairobi where the ODK ‘Aggregate‘ tool is used for analysis. This week the G-8 International Conference on Open Data for Agriculture takes place in the USA. Tags: ODK, openagdata, opendata. Bookmark the permalink.